Dr. Richard C. Box is Regents/Foundation Professor Emeritus at University of Nebraska at Omaha. He has taught at University of Colorado, Colorado Springs (1990-1998), University of Nebraska at Omaha (1998-2011), Park University (2011-2015) and University of Florida (2015-present). He is the author or editor of several books, including Public Service Values, Routledge, 2015, and Public Administration and Society: Critical Issues in American Governance, Routledge, 3rd edition 2014. Dr. Richard Box served as a land-use planner and administrator in local governments in Oregon and California before completing his doctorate at the University of Southern California. He has taught at University of Colorado at Colorado Springs (1990-1998), University of Nebraska at Omaha (1998-2011), Park University (2011-2015), and University of Florida (2015-2016), face-to-face and online. His writing focuses on the interaction between public service professionals and the political, legal, and economic environment that surrounds them. In addition to many scholarly articles and applied research reports, Dr. Box is the author or editor of the following books: Public Service Values, M.E. Sharpe/Routledge, 2015; Public Administration and Society: Critical Issues in American Governance, M.E. 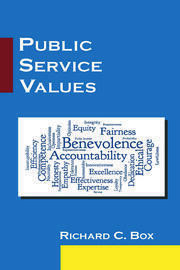 Sharpe/Routledge, 3rd edition 2014; Making a Difference: Progressive Values in Public Administration, M.E. Sharpe/Routledge, 2008; Democracy and Public Administration, M.E. Sharpe/Routledge, 2007; Critical Social Theory in Public Administration, M.E. Sharpe/Routledge, 2005; and Citizen Governance: Leading American Communities Into the 21st Century, Sage Publications, 1998.